opened on June 7 and runs through Sept. 15. 8/3/13 by Hugh Ryan- The New-York Historical Society’s current exhibition “AIDS in New York: The First Five Years” accomplishes a neat trick: it takes a black mark in New York City’s history — its homophobic, apathetic response to the early days of AIDS in the early 1980s — and transforms it into a moment of civic pride, when New Yorkers of all stripes came together to fight the disease. It’s a lovely story, if only it were true. To judge from the opening animation — a short video titled “What is AIDS?” — this show is aimed at AIDS neophytes, and as an informational vehicle it succeeds. Many of the images and ephemera are powerful testaments. But such details sit against an apologist backdrop that sees the city through rose-tinted glasses. The medical community is handled with an especially light touch. While the show rightfully praises those who worked tirelessly to find a cure and provide palliative care to the dying, someone without prior knowledge of the epidemic could easily leave without understanding the bitter, hard-fought battles that activists waged to gain treatment. Though more than 850 New Yorkers had died by the end of 1983, Mayor Edward I. Koch’s administration had spent only a cumulative $24,500 on AIDS. Research, apparently, wasn’t the only thing that was slow. After seeing this show, a newcomer to this history would be hard pressed to understand the rise of the street-activist group Act Up, the takeover of the Food and Drug Administration headquarters by protesters or the legacy of mistrust between the medical-industrial complex and lesbian, gay, bisexual and transgender people. Here, grammar is put through the ringer to avoid blaming homophobic, apathetic New Yorkers for their inaction. But the queer community’s own supposed failings are easy to read. Statements like this were not uncommon at the time. But the exhibit merely says: “Since many religious groups felt homosexual activity was unnatural and prohibited by the tenets of their faiths, churches, synagogues, and individual religious groups responded to the AIDS crisis in different ways. Some were quick to judge and preached caution.” Caution? That’s one word for it. Others might say fear, misinformation or hate. Although not strictly untrue, this is certainly the most forgiving phrasing possible. The unfortunate side effect of this continual soft-pedaling of homophobia is that the queer community — our anger, our mistrust, our fear — is rendered incomprehensible to the viewer. If everyone else behaved so well, why were (and are) we so angry? The Historical Society deserves some praise for tackling this topic at all, having failed up to now to address queer issues in any way. 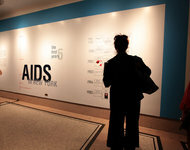 And yet, precisely because of this background, Jean Ashton, the exhibition’s curator and the museum’s senior director for resources and programs, should have worked harder to include the insight of those already active in chronicling AIDS and its legacy. The funding for the exhibition came from upstanding sources like the Ford Foundation, and the programming and collections drew on resources from local academic institutions. It’s obvious there was scholarly input in the exhibit’s development, but it is not evident from the museum floor. Bad history has consequences. I’m not afraid we will forget AIDS; I am afraid we will remember it and it will mean nothing. If we cannot face the root issue — that we let people die because we did not like them — AIDS will become a blip on our moral radar, and this cycle will repeat every time we connect an unpopular group with something that scares us. A few months ago, I watched a man agonize over the prospect of sitting next to a couple who appeared Middle Eastern on the subway; 30 years ago, that look of fear and hate could easily have been directed at my boyfriend and me. New Yorkers are strong; we do not need to be protected from our past. Instead, we should learn from the hard truths and bad choices it contains. It is not enough to mourn the dead or memorialize the survivors; we must confront history in all its painful, guilt-inducing glory and use it as a guidepost for our behavior today. The Historical Society has taken an important first step toward addressing this difficult moment in our collective history. Here’s hoping future portrayals will be less celebratory and more investigatory. Hugh Ryan is a freelance writer and the founding director of the Pop-Up Museum of Queer History.